artist and Galerie Xippas. Photo: Frédéric Lanternier. From October 15, the exhibition will be presented in the gallery’s showroom, with a evening viewing Thursday, October 24 until 10pm. Farah Atassi’s early paintings of interiors (2008–2011) invited us into ghostly spaces, which were for the most part reproductions of Soviet-era collective homes. However, her 2012 work Workshop marks a turning point, and her recent works confirm this new direction. Modernism persists in these paintings not in the form of ruins or disenchantment, but as a celebration. For her second solo exhibition at the Xippas Gallery, Farah Atassi displays a group of never-before-seen canvases that she produced in New York while at the ISCP residency. In these works, she confronts modernism with a rival aesthetic: German Expressionism and folkloric ornament. Farah Atassi uses a grid on the canvases to construct an all-over pattern: a cardinal element of modernism. Because the pattern occupies the entire surface of the canvas, it produces a paradoxical effect that enables the flatness of the surface plane to contradict the visual illusions produced by the painting. Within the maze of squares that efficiently make up the composition, “display” objects overlap and interlock in the complexity. These include building or factory models, miniature models, and toys from the European avant-garde. This interplay of construction—inspired by German educational placemats dating from the beginning of the 20th century—are displayed on pedestals or even on the floor of interiors in order to create a subtle dialogue. The consistent dual presence of the all-over backgrounds and display objects in Farah Atassi’s paintings allow her to create a dialectic where she confronts modernism with aesthetics that are generally considered as contrary, such as Expressionism and ornament. For example, in Toy Town II, the zigzags in the background interrupt the modernist grid and also echo Lyonel Feininger’s expressionist cathedrals. In Tabou I et II, German folk decorations graft onto the modernist framework. This interplay of opposing aesthetics was inspired by Fritz Lang’s Nibelungen, where we see a strange aesthetic mixture of Bauhaus and German folk art. With these new paintings, Farah Atassi creates secret and mysterious spaces that continue to fascinate us. 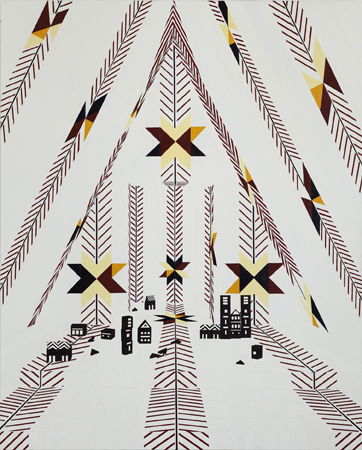 Born in Brussels in 1981, Farah Atassi is one of the most important artists in her young generation of painters. She was the first to be awarded the Jean-François Prat Prize in 2012. This year she benefitted from a six-month residency in New York with the International Studio & Curatorial Program (ISCP). Her works are part of several collections, including the National Museum of Modern Art/Georges Pompidou Center, Mac/Val (Museum of Contemporary Art in Val-de-Marne), and France’s National Collection of Contemporary Art. She is currently participating in the exhibition Entre Deux, at the Regional Museum of Contemporary Art in Languedoc-Roussillon de Serignan (open until November 3), and the exhibition for the 2013 Marcel Duchamp Prize nominees at the Museum of Fine Arts in Lisbon (open until September 15). She is one of four nominees for the Marcel Duchamp Prize and the winner will be announced during the 2013 Fiac.